Wednesday August 3rd 1881 I got my work done up and went up to practice. Winnie came home from Cedar Rapids this morning. I was busy at home all the afternoon. Hattie is improving but the baby is not well. Thursday August 4th 1881 I went up town again this forenoon and was busy working on my mat all the afternoon. The baby continues very fretful. Friday August 5th 1881 I did not get started up to Wins very early this morning. I took a lesson today I hurried home and got the dinner over. I put in a big afternoons work on my mat. 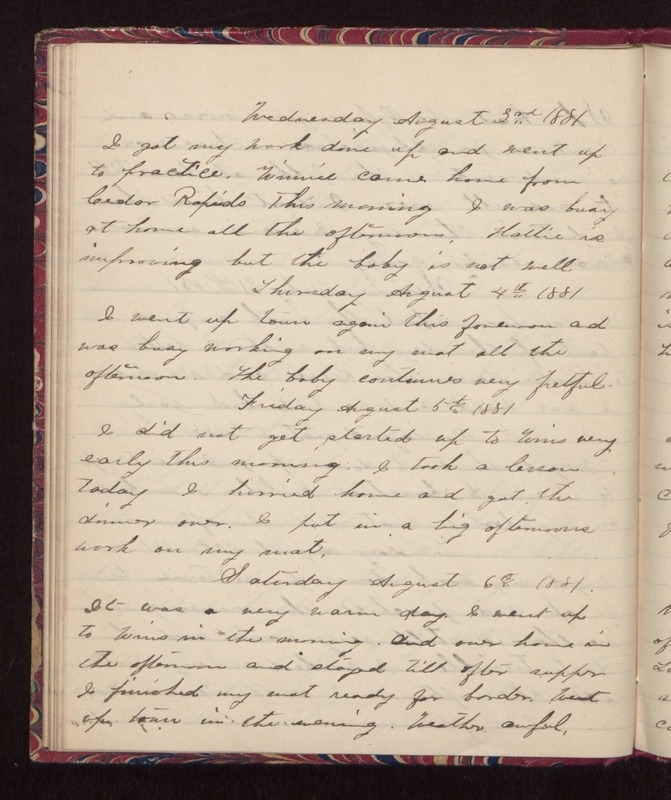 Saturday August 6th 1881 It was a very warm day. I went up to Wins in the morning and over home in the afternoon and stayed till after supper. I finished my mat ready for border. Went up town in the evening. Weather awful.